18 channels. Provençal farmhouse with swimming pool in a property from the 18th century. 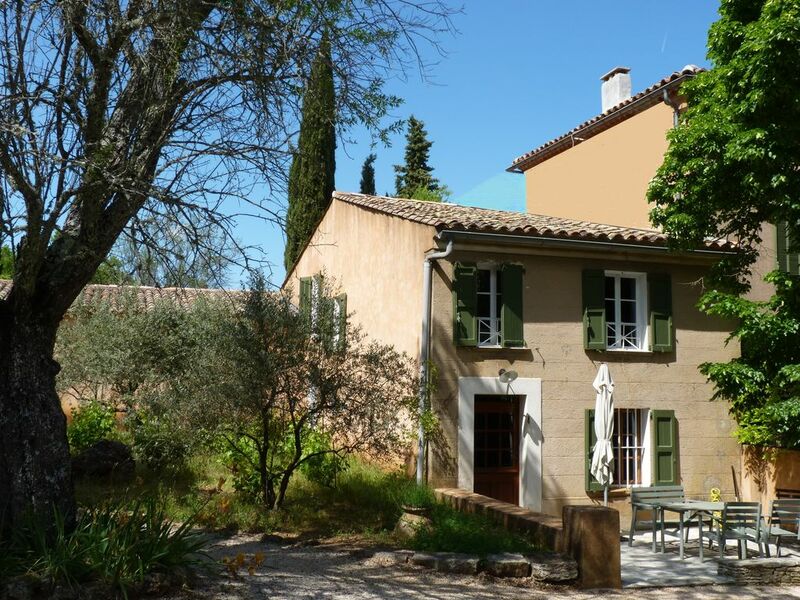 Provençal farmhouse located in a 7 ha park planted with trees. Unique location. Very quiet. View on the Ste Baume massif. Pool with pool house. Golf (18 holes close by). The farmhouse has been restored respecting of the Provençal architecture. Bath and toilets in perfect condition. Fully equipped kitchen, with Nespresso coffee maker. Caps on site at the same price as the Nespresso price. Pool of 12 X4.5, with pit diving at 2.80. Flat screen television (Freeview). Bans les Pins has a good Spar, boulangerie and pizza restaurant. Excellent accommodation and Sabine was a very good host. Lots of good walks to do. We would book again. I rented this property for 6 weeks in preparation for moving to the Cote D'Azur for work purposes. The owners have been very helpful towards me and my dog and made my first few weeks living in France a success. ould not have hoped for a better place to spend six weeks in France! The house was absolutely beautiful and perfectly located outside of Marseille, an easy bus ride away. The town is lovely and close, and the property itself is so inviting and pleasant that it was hard to motivate ourselves to go elsewhere! I was travelling with a friend who had never been to France, and the family could not have been more inviting, helpful, and warm. We felt right at home! It was so hard to leave, but I can't wait for the next time I need to escape my real life in the US, because I will definitely be looking this place up again! Les propriétaires sont très accueillants et arrangeants. La propriété est magnifique et le logement très bien conçu, pratique et très bien décoré à la fois. un grand merci pour ce gentil commentaire. Au plaisir de vous accueillir à nouveau. Très bel endroit correspondant au descriptif qui apparaît sur le site. Gîte confortable, dans un écrin de végétation , endroit calme et propice au repos. Das Haus ist sehr sauber, geschmackvoll eingerichtet und es fehlt an nichts. Wir haben uns auf dem großen Gelände, das direkten Zugang zum Wald und zu Wanderwegen hat, sehr wohl gefühlt. Claude und Sabine sind hilfsbereite und unaufdringliche Gastgeber. Vielen Dank für einen wunderbaren Aufenthalt. The farmhouse is south-facing with a free view on the massif of Saint Baume. View of the park planted with hundred-year-old trees from the house. The natural shade produced in the middle of the day by the linden tree is very nice. This place is very quite. The village is located 1.6 km: you will find all shops very close by and 2 mini markets. The supermarket is 7 km away.